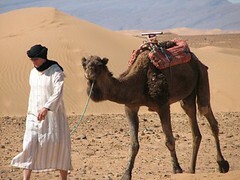 Welcome to Caravan Desert et Montagne – a small but perfectly formed tour operator. We believe in creating individual programmes for our clients. Want to trek through the desert? Ride a camel? Learn about the desert’s history and people? Have a special celebration with family and friends, or perhaps a honeymoon? Whatever you are looking for, the exchange of ideas and opinions is necessary so please, let Brahim know your wishes in advance so the schedule can be tailored to your expectations. We believe in tourism that aims to preserve and maintain. We therefore pay careful attention to the nature around us and act responsibly wherever we travel. To provide you with a true impression of the traditional life we work closely with nomadic and Berber families, many of whom have become personal friends. 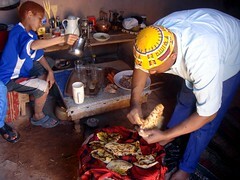 These families will be your hosts during our travels and will share with you the traditional cuisine, the music and routines of daily life: unique experiences that are hard to find. We pay all our guides fairly and support projects in the communities that we visit. Our travel groups are limited to a maximum of 8 people. This ensures a personal, flexible approach that allows ample time to immerse yourself in the local life. Upon request we can organize these travels for 2 people or more. We will be at your side during the whole trip so that you always have someone who understands the local culture and can overcome any language barriers. We are also happy to plan and organize your individual journey, should you wish to travel alone. We will tailor the travel to your wishes. Just tell us what you need. Want to read more? Our work has been featured in Britain’s Observer newspaper and we have advised the BBC on nomad life.